Thanks to everyone for helping to make our 24 hours up at our favorite Jackal Hut so special! It really meant the world to Kristine & myself that our friends and family came from all over to help us celebrate completing the 7 Summits together. But, more than that, it was just so much fun and special to spend quality time with our families, new & old friends, and canine companions in such an amazing setting. It was pretty cool to share the high country of Colorado with our parents as well as old climbing buddies who came from afar. The weather on Saturday wasn’t ideal, but as Joel promised the clouds and rain/snow mix started to clear out around 6pm and a wonderfully crisp, cool, and starry night ensued full of good laughs around an outdoor campfire. Sunday dawned a sunny and clear day. We all had a great breakfast of bagels/cream cheese and pancakes. Most folks coordinated the 4WD descent before noon, but Ken Oelberger, Rob Casserley, Chase Lochmiller, Kevin Vann, & myself stayed around for a few hours and hiked up the east ridge towards Pearl Peak. Another amazing aspect of the weekend were how many of our wonderful friends and climbing buddies who actually shared a 7 Summit or two with Kristine & myself came from all over to help us celebrate. 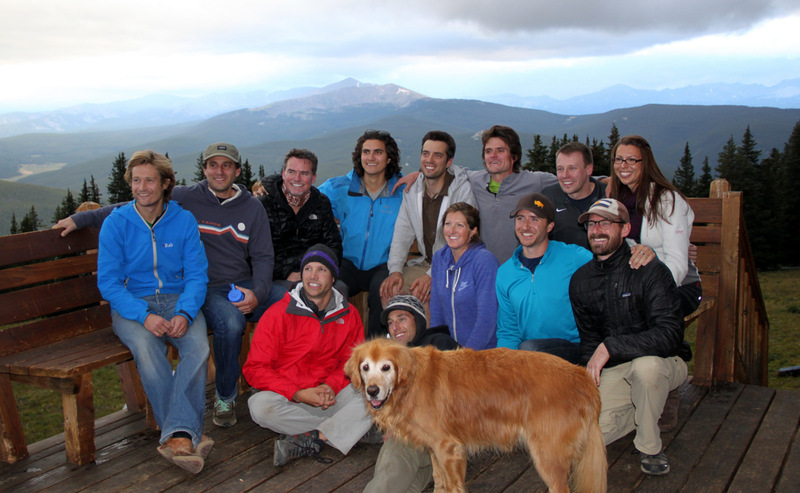 A few Kilimanjaro folks (Dave & Sarah Levinson and Alex Parillo), a few Everest folks, Henry Herring, and Sean Swarner were missing, but other than that everyone with whom we shared one or more of the 7 Summits was present! Kristine & I could not have accomplished the goal of climbing the 7 Summits of the world together without each other. I don’t think we would have even wanted to try. We need each other more than we know on these big climbs and in life in general. I can’t tell you how many times she has been there for me in times of stress or duress. I think the same is true vice versa. Another highlight has been sharing these experiences with good friends of ours. Thanks to Lee Hoffman & Rob Schnare for the experiences and memories on our first big international mountain (besides Orizaba in 2005) – Aconcagua in 2006. Thanks to J Weingast & Sean Swarner for being wonderful climbing partners and friends to Kristine and myself on our first of the 7 Summits together – Denali in 2007. Thanks to Derek Drechsel & Rob Schnare for the sketchy Russian adventures on Elbrus in 2008, in the Russian countryside, and in Moscow. Thanks to Caleb & Jennie Wray for being such fun travel companions around France and climbing partners on Mont Blanc in 2009. Thanks to Henry Todd, Fi Ramsden, James Stearns, & Rich Birrer Jr & Sr for their companionship & support on Everest in 2010. A very special thanks to Rob Casserley for always being a great friend and mentor on Everest in 2010 and ever since. Thanks to Dave & Sarah Levinson, Scott & Darci Hook, Jamie Buckley, Chris Carlsen, & Alex Parillo for the camaraderie and friendships on Kilimanjaro in 2011. Thanks to Henry Herring for his spirit of adventure and willingness to try new things (like snowshoeing) on Kosciuszko in 2012. Thanks to Brett & Maura Wamsley for their support on Aconcagua in 2013. Lastly, thanks to Kevin Vann for his friendship and fun spirit (as well as the rest of the crew and ANI folks in this report) on Vinson in 2013. 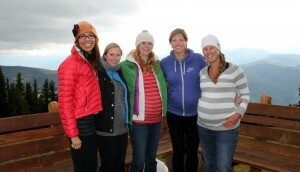 Lastly, we may have had another record number of pregnant ladies at a 10th Mtn Hut. Including Kristine, there was Anna, Sarah, Eileen, and Darci. Anna was also 2 weeks away from welcoming their baby into this world! 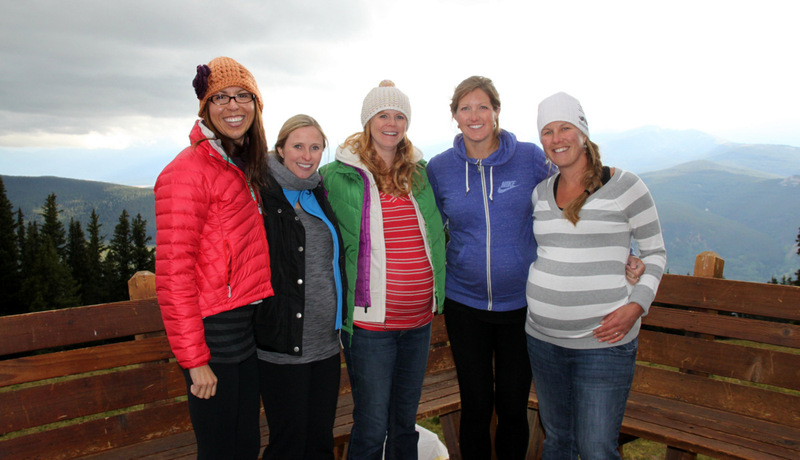 Very impressive being at an 11,660′ hut at 38 weeks pregnant! Thanks again to everyone for a memorable get together to conclude this amazing chapter in our lives!